All spaces between two copper entities must be, at least, 6 mils (0,15 mm) far each other. 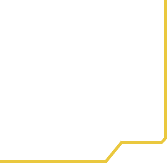 All copper entities must be drawn with a 6 mils (0,15 mm) or larger track width. In case of copper thickness of 90 µm the minimum width must be at least 12 mils (0,30 mm). The smallest drill size we can drill is 8 mils (0,2 mm) and it must have an anular ring of, at least, 6 mils (0,15 mm) for drills smaller than 79 mils (2,0 mm) and 8/10 mils for bigger drills. 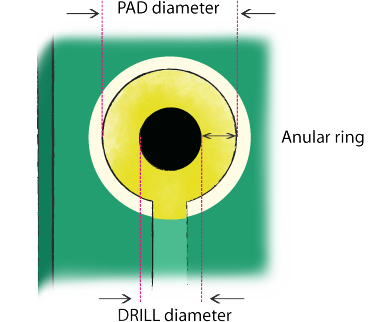 Since anular ring affect solderability, it's recomended to use an anular ring of 8/10 mils (0,20 mm) or bigger on every pad and use 6 mils anular ring only for vias. 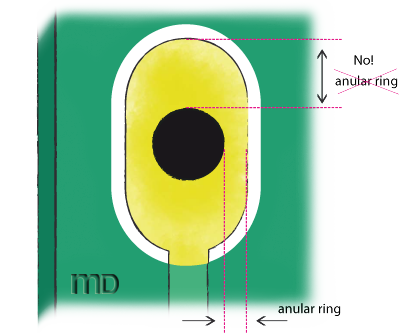 In case of oval or rectangular PAD the anluar ring is the lesser of the two that you can measure as you can see in the picture. Solder mask swell should be at least 8 mils (0,20 mm) larger than copper surfaces to keep mask off pads. The minimum distance is 8 mils (0,20 mm). 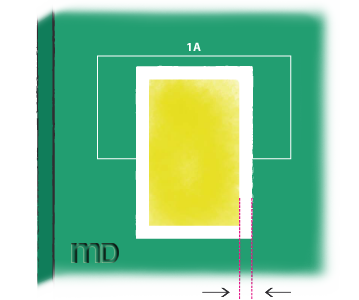 We will try to correct this problem if occur, but, sometimes, due to particular DCODE shapes used in Silkscreen Layer, the check will pass OK even if there is some silkscreen on copper surfaces. You should be very carefull in checking this because it can cause difficulties in solderability of the components on the board, especially if SMD technology. Copper entities must be at least 8 mils (0,20 mm) far from the border outline. The border outline is routed with a 2 mm routing tool, and, where necessary, with a 1 mm routing tool. Any shape is possible, but you have to draw your board outline at least on one layer (copper, soldermask, silkscreen or a specific file for dimensions). The ground plane, particularly in the inner layer of a multilayer Board, must be distant from the edge at least 8 mils (0,20mm). 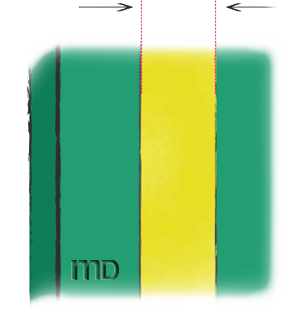 Failure to observe this rule on multilayer board could lead to delamination. Internal cutout is possible but is subject to approval. The smaller routing tool we can use is 1 mm. 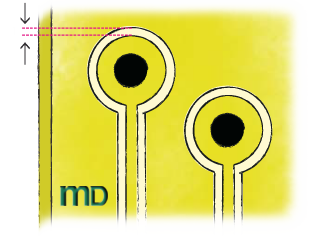 If you use internal cutouts please highlight them on the PCB design and, if possible, add a comments to your pcb order. If you use Pad's internal cutouts (1 mm min.) the anular ring must be at least 20 mils (0,5mm). 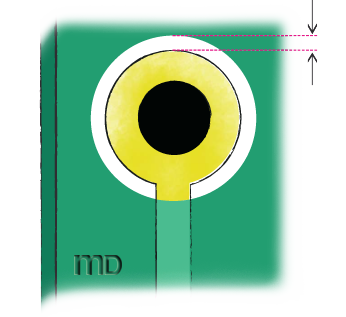 The minimum width of the line you use to draw the component overlay on the PCB must be 0,16 mm (6 mils) minimum. It's true that all spaces between two copper entities must be, at least, 6 mils (0,15 mm) far each other, but, when we talk about ground planes, avoid using 6 mils (0,15 mm) spacing if not necessary. Please use instead 8 mils (0,20mm) spacing at least. 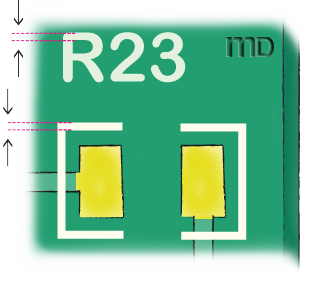 Component supply method : mdsrl.it prefers to mount the components supplied by the customer, but may purchase them from Farnell or, in case of non-availability, also from RS and Digi Key, with an additional 20% fee on the suppliers' list price. We ask that the cost of components is paid in advance by bank transfer, credit card or Paypal. It must contain all the components, even those who do not have to be mounted by mdsrl.it (use the column "Mount YES/NO" and indicate "NO"). In case you ask mdsrl.it to provide and buy the component, you must also specify the name of the distributor and the link to the product on the distributor's website. Use this spreadsheet to supply a complete BOM (here is a sample BOM). It is a text file generated from your CAD software. It contains all the information needed to place the components and their orientation. The coordinates must be related to the center of gravity of the component. The components must have the same name used in the BOM. It must be specified if the component is to be mounted on the TOP or BOTTOM side. 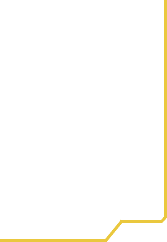 It is a Gerber RS274X format file which depicts the outline of the board and the individual components with the same names that appear on the BOM. In the event that your components has a polarity (diodes, electrolytic capacitors, integrated, connectors, etc.) it must be clearly indicated. You can ask mdsrl.it to buy the electronic components for you from Farnell or, in case of non-availability, also from RS and Digi Key. The list price of the components will be charged a 20% increase for operating costs and will be required to prepay to mdsrl.it the cost of the components. The order of the components to the supplier will be placed upon receipt of payment. The BOM must include the supplier's name and a link to the specific product on the distributor's website. If you use our Express Courier we will pay for the shipping costs of the components (EEC countries only). When you submit your order you will receive an email containing the instructions on how to ship the components (EEC countries only). Items shipped must be properly labeled with the same name used in the BOM. Passive Components 0603 case or larger, supply 20% more with a minimum of 10 pieces more. Passive Components 0402 case, supply 100% more with a minimum of 20 pieces more. Active Components: depends on their cost and their type of packaging. It would be ideal to have one or two more than what is strictly necessary. Components that are not used, will be returned to you along with mounted boards. All components must be shipped in their original packaging or in any ESD packaging to prevent electrical or phisical damage. The NC Drill file is a TEXT file (you can view it using a text editor like Windows Notepad) that contains a set of XY coordinates. During the order process it is possible to upload one single file per pcb (a line in the shopping cart): please verify that your files are all compressed in a single file using your preferred format (.zip, .rar, ...). A compressed file containing a pcb design data usually is a few Kb in size. If the compressed file size is more than 2 Mb you are probably sending unecessary documentation or you are using too much and too thin lines to generate ground planes. 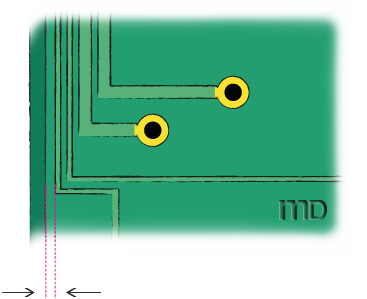 All our Multilayer pcb are drilled using an Optical Innerlayer Registration system (OIR by Schmoll) that measures effective size of innerlayer after the pressing stage. This methods allow our Multilayer Boards to have the drills perfectly centered even in the inner layers' pads so you can be sure you will always have a maximized contact surface between inner layer copper and copper inside the holes. We make SMD stencils on a 150 µm thick Nickel Silver plate, or on INOX for 120 and 100 µm thickness. 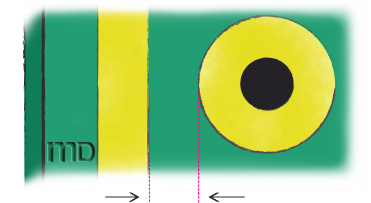 Maximum overall dimensions are 500 by 300 mm. The smallest pad we can etch is 7 mils (0,18 mm) big. The dimensions of every pad on the stencil will be reduced by 10%. To make a SMD stencil we need the corresponding file (in Gerber format) generated by your CAD software. 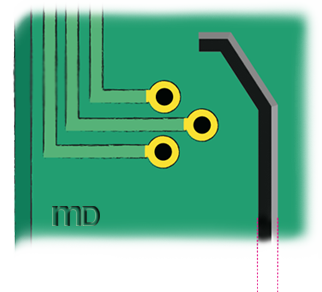 Alternatively we can generate the stencil file for you, starting from the solder mask layerof your printed circuit board, but it's always preferable to use the one generated by your CAD software. It is preferable that your stencil design has a border otherwise, please, specify the dimensions on the notes while ordering the stencil. You can order a stencil in two ways: "standalone" or comkbined order with a pcb obtaining 50% discount on its price. a form will appear where it will be possible to write the dimensions and your internal code, if present, of your stencil. 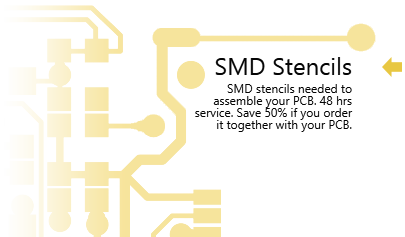 To order a standalone SMD Stencil, you can start by clicking "SMD Stencils" on the homepage. and proceed by specifying the dimensions, choosing the quantity and proceeding to upload the stencil file generated by your CAD.